i met up with some of my high school classmates whom i have not seen personally for a few years back when i was on my vacation last march. it was a way of reminiscing our good old high school years, specially the fun moments we had together. it was also a good chance for me to tick off one of my 10 things i have not done before item when everyone was asking to decide where to have our late dinner. the mall we met up was just near barrio fiesta, a filipino restaurant that is famous for the dish, crispy pork knuckle or crispy pata. i then suggested the place and they agreed, unknowingly, they did not know my real purpose. it has been years since i last ate pork. i stopped eating it when i was in junior high school, the reason still unclear even to myself which is straightforwardly odd! 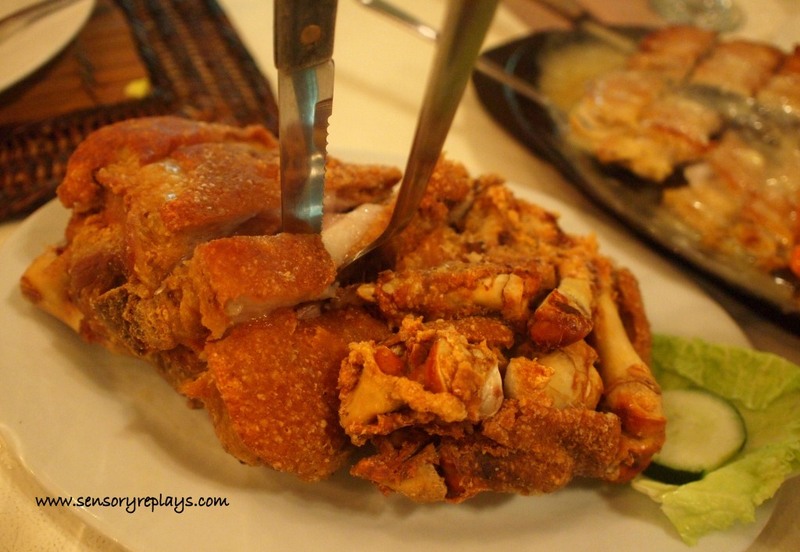 to cut it short, let’s not talk about it and focus on the crispy pork knuckle itself. hehe. crispy pata is the hind leg including the knuckles of a pig boiled in broth with spices, drip dried or drained, rubbed again with spices and then is deep-fried until golden brown. 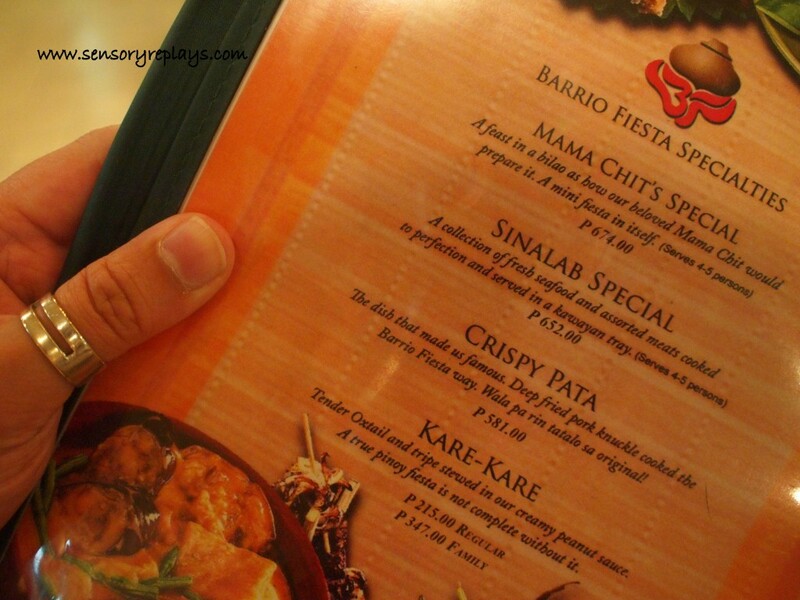 here is the famous crispy pata of barrio fiesta. crispy on the outside and succulent on the inside. i wonder how much percentage of cholesterol one serving has. This entry was posted in palate teasers and tagged 10 things i have not done before, barrio fiesta, crispy pata, deep fried pork knuckles, lechon kawali, pan-fried roasted pork. Bookmark the permalink. lets cross out YOGA in your list, soon! .. try natin sa july chyng, baka matuloy na tayo nun! done with this, now go back to being pescetarian. .. masarap nga doc! haha. i think i can no longer be considered pescetarian for i went back on eating chicken pero totally no red meat. c’mmon, try some tender juicy steak next time! you must have a strong resolve to be able to abstain from eating pork and beef for all these years. culinary celibate ka na ngayon LOL. .. i may be a bachelor bert – but i’m never celibate! .. hi jen! masarap naman kasi talaga ang pork dishes. pag-uwi mo sawain mo pagkain. damn rob, a year without pork? god, i don’t know how you do it buddy. you’re awesome. 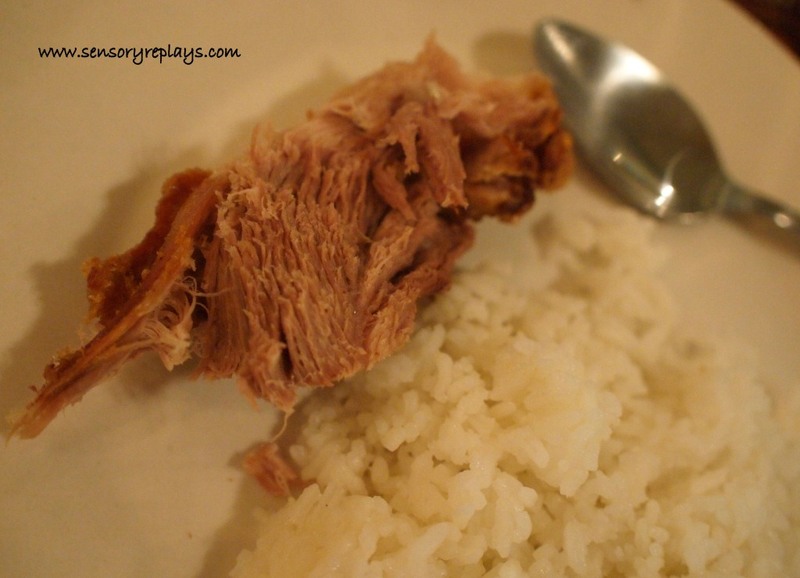 isang slice na bite size ng crispy pata ay magpapahilo sa akin, kaya i don’t eat it too. pero minsan, nakakatukso talaga. hahaha. that’s odd to think you’d shy away from pork and not know the real reason. go dig deep into your subconscious. it’s buried there somewhere. i haven’t eaten that in ages either. with me it’s more shying away from fat and cholesterol – i won’t wait until i get a problem to stop eating it. .. possibly something traumatic happened between me and a pig. hehe. that crispy pata looks fiiiiiiine. a friend in college urged me to try being a something-you-eat-only-chicken-and-fish-tarian and i managed okay for a few weeks until my mom served us crispy pata. crispy pata is my kryptonite. .. most likely i’ll also get tempted! i practice that kind of diet ayla, no red meat or the lacto-ovo-pollo-pesco diet. used to be pescetarian but it became too difficult for me to manage here at work. whoa!!! miss q na pork!!! drool! .. yes it’s drool worthy, riz!